Thirza Vallois is a long-time Parisian - so long that she no longer quotes the years . . .
now available as an eBook - is entirely revised and updated from its earlier editions. to mark the publication of her eBook and find out more about her work. FRANCE On Your Own - When and why did you decide to become a writer? Thirza Vallois - I never decided to be a writer. It just happened. FOYO - Why did you choose to write specifically about Paris? TV - At one point in my life, I had a complicated love-hate relationship with Paris. I still get exasperated by Paris occasionally. Writing about Paris started out as a therapy. I wanted to understand the French psyche. But I also wanted to enlighten foreign visitors and readers who have a special interest in France, which is why I wrote my books in English although I am bilingual. I wrote them for foreigners, although many French people who know English too also read them. I was aware that I knew how to travel - something handed down by my mother combined with an innate flare - knowing instinctively what to seek and where to seek it. I used to walk my friends' and relatives' feet off and opened to them secrets that tourists normally would never find on their own. Many Parisians didn't know those places either. I also loved fashion, art and great restaurants, of which there was no shortage in Paris. Add to this my academic background and my studies of French humanities in particular, at some point everything crystallized, and I started to write. FOYO - How did you go about acquiring your information? TV - I walked and walked and walked. When my feet would swell and ache beyond the bearable, I headed to the city's various libraries, did my research, then went back to the streets once more. I also acquired many books and did some of the reading at home. During my explorations of a given neighborhood I spoke with a lot of locals. As I am sociable and because I spoke French, I collected a lot of fascinating stories from old timers. FOYO - How did you put it all together? TV - Frankly, I don't know. I am myself overwhelmed when I look back. I don't believe I could do it again. It was one of those moments in life when nothing existed other than this project. I poured my entire heart and mind into it for fifteen solid years. It was not the accumulation of facts and information that were challenging. The challenge was to bring all this information together in a way that would be enlightening, entertaining, surprising and impeccably structured - to bring Paris, both past and present, alive to turn it into a theatre stage, to allow the reader to hear the music, the songs, the angry vociferations of protesters or the church bells, to allow him or her to inhale the smells of the street markets. But I also wanted to help the reader understand the city, and via the city, to understand the French. I worked on these books for years and years. An entire room was allocated to piles of notes, sorted out according to their topics, sometimes duplicated as they belonged simultaneously to several arrondissements. There were piles of paper everywhere, on furniture, on the carpet... nobody was allowed into that room. And I was using an old typewriter! The computer came into my life only towards the end. FOYO - Tell us something about the books. TV - The title of the series really speaks for itself - a title that took me seven years to find! At first glance, it seems almost simplistic. In effect, it sends out the message most accurately. The reader walks around Paris to find out the story about Paris. Not just the history. The books are also about today's Paris. They follow the twenty arrondissements of Paris, which have a spiral layout (hence the double meaning of 'around' in the title), starting on the central island, l'Ile de la Cité, where the city was born, and finishing in the 20th arrondissement, uncannily, home to Père Lachaise cemetery, the end of the journey on this side of life. It took me as long to find the appropriate introductory quote for the book, one that would sum it all up. Victor Hugo came to my rescue with the following: "He who looks into the depths of Paris grows dizzy." I take the reader to hidden Paris, the nooks and crannies that most tourists have never even dreamed, but also to the Paris underneath the cobblestones, layers and layers of it. As well as to the city's hidden truths, so often overlooked or distorted by the media and even by history (the storming of the Bastille for example, the Knights Templar...). Whenever appropriate I destroy such clichés and myths. FOYO - Your books are meaty, long and detailed. How do you advise the reader to make the best use of them? TV - Each arrondissement starts with an introduction and is followed by walks. If you know little about Paris, you are better off starting out modestly. Pick one arrondissement or two for your visit, and focus on them. Before heading out, read the introduction, once or even twice. You will understand the character of the area you are about to explore. This will enhance your pleasure and understanding once you are out there. There is no point in trying to embrace everything. I believe in slow traveling and slow explorations. You want to stop and gaze, you want to contemplate and muse, you want to sit on a bench and read an anecdote, you want to take your time to appreciate a beautiful building or courtyard, a fabulous shop window display. Choose an arrondissement that appeals to you in particular or an area close to where you are staying - an area that intrigues you. They are all equally interesting, even though some are more famous than others. On one occasion, an Australian couple came over for an entire month, deliberately to explore the entire territory of volume one. They did all the walks in my "company", as they told me when the month was over and we met for a cup of coffee. They gratified themselves daily with a first-class restaurant, a well-deserved ending for a hard day's work! It was heart-warming for me to know that I had given a couple from the other side of the world such an experience. 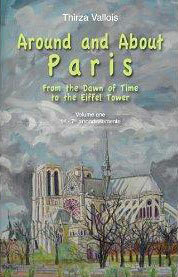 FOYO - You have recently updated and revised Around and About Paris, Volume One. Has Paris changed a lot since you first published your books? TV - I am happy to say that most of what I wrote in the first edition of Volume One is still valid. I am more concerned about changes in some of the neighborhoods covered in the other volumes and especially concerned by some of the projects planned by City Hall for the very near future. I am also upset that the the city is not looked after as well as it was a few years ago. FOYO - Tell us something about your eBook. TV - Ironically, I don't own a Kindle yet. I love holding a book in my hands, and in general am always years behind before embracing a new technology. I am not necessarily right, but that's how I function. I am more comfortable in the old ways, and it takes me a while to adjust. That doesn't mean to say I am not aware that the technology is there and that some of it is beneficial. The eBook falls into this category. It is ideal for following the walks in my book. It is lighter and less expensive to buy. FOYO - Will you revise the next volumes as well? TV - I am hoping to. But it takes time. It took me a year and a half to revise Volume One. I also intend to publish my book Aveyron, A Bridge to French Arcadia as an eBook. It's a book that gives you a deep understanding of rural France, which is where the heart of France still beats to a certain extent, even in this fast-evolving world. FOYO - Are any other books in the planning stage? TV - Possibly. I don't like to anticipate before things actually happen. I have several projects in mind. Time will tell which of them will materialize. I write quite a lot of articles for various media, and that, too, is very time consuming as it involves a lot of research and sometimes a lot of traveling. online at Amazon.com - click below to purchase it today. and in this, our Summer issue, we will visit the départements of Nièvre and Saône-et-Loire. 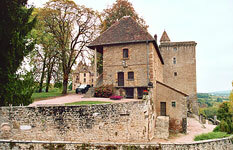 we will encourage you to discover it yourself when you next visit France. Burgundy draws travelers from all over the world to its rolling green landscape, amazing wines and pleasant towns and cities. Once you've visited, it is easy to understand why this is true and why you will want to return again and again. The départementof the Saône-et-Loire (71), south of the Côte d'Or, claims as its capital the city of Mâcon. Due to the anti-religious sentiment during the Revolution, fourteen of Mâcon's churches were destroyed. Thus, one finds little in the way of church art and architecture in this wine center of southern Burgundy. However, the Musée des Ursulines (a converted convent) has a fine art and prehistoric collection. 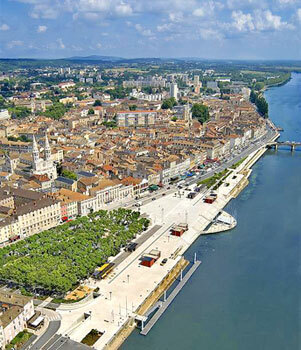 Here the River Saône (pronounced Sohn - rhymes with Rhône) provides boating opportunities, and the city's appearance with its red roof tiles reminds one that the south of France is not too far away. For wine lovers, it is along the wine route! Also in the département is Autun with its enormous gateways, a reminder of its strong Gallo-Roman past. 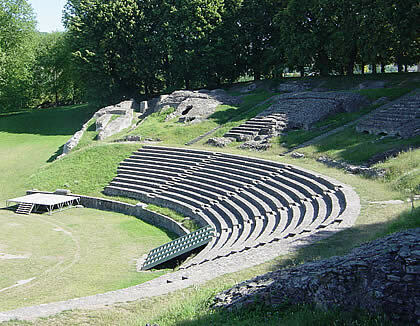 The remnants of Roman-Gaul's largest theatre is here, along with a temple built to honor the god, Janus. The name 'Autun' is derived from its original name 'Augustodunum' meaning 'sister and rival of Rome'. Cluny, famous for its Benedictine abbey (Ancienne Abbaye St-Pierre et St-Paul) founded in 910, is just northwest of Mâcon amid the vineyards. Most of the abbey was purposely demolished in the 1793 leaving only a bell tower and part of the transept in tact. What remains is less than ten percent of the floor area of Cluny III, which was the largest church of Christendom until St. Peter's Basilica in Rome was built five centuries later. 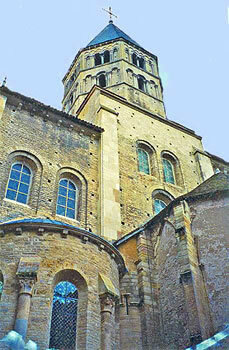 Nearby Berzé-la-Ville has a chapel decorated with twelfth-century frescoes like those once found at Cluny. The area south of Brancion and Tournus is hilly, covered in vineyards and orchards and dotted with red tile roofed farmhouses. The famous Pouilly-Fuissé vineyards and the ruins at Solutré can be found just west of the city Mâcon. One glance at your Michelin map will make it clear how beautiful this district is - green tracings along the highways indicate scenic drives are everywhere! One of the best experiences of driving in France is coming upon something that is a pleasant surprise ~ unplanned, not on our itinerary ~ just there for us to enjoy around the next bend in the road. 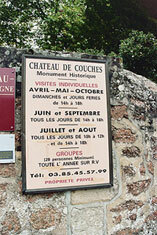 Such an experience was our discovery of Château de Couches in 2009. While driving along the D978 in this lovely part of Burgundy, we came upon a massive château whose first stones were laid in the eleventh century and whose construction evolved through the nineteenth century ~ its architecture a testament to the influences of different periods of taste and design. The medieval donjon is one of the few remaining original structures; the fifteenth century Gothic chapel is named for Saint Ruf, a fourth century Auvergne Christian. 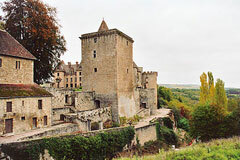 This château with its many buildings houses underground galleries, a guard room, and a justice tower, while the exterior boasts a drawbridge, park and topiary gardens and a pavillon popular these days for weddings. Privately owned, tours are given on specific dates and at specified times.